*The standard machine is available with either high speed or low speed gear ratios, each having a four ratio quick change gearbox. Various gear ratio and motor combinations are available according to the customer’s requirement, including high torque versions. 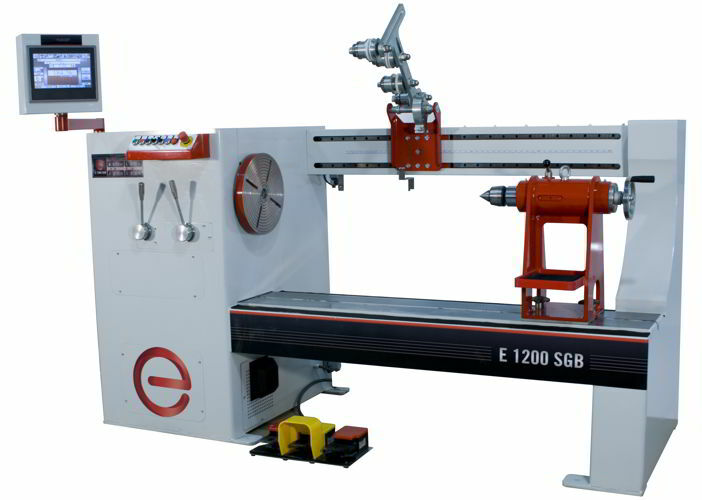 The E-1200-SGB is a high power, one spindle floor standing coil winding machine with a colour touch screen CNC, precision servomotor drive, and four-ratio gearbox. The winding machine is strongly constructed from heavy guage welded galvanised steel, with machine covers in stainless steel and is provided with a fixture plate, tailstock with security closure, guider system, safety guard and foot pedal. This machine is specially designed for the manufacture of large wound components, including motors, solenoids and power distribution transformers (typically from 10 to 2000 KVA), using aluminium or copper wires (including rectangular or flat wires with a special guider). The wide range of available winding speeds, (up to 750* rpm.) permits primary and secondary windings to be produced on the same machine, thus reducing production cycle time and number of processes to a minimum. The layout and design of the winding machine facilitates the placement of ancillary materials such as end-fillers, insulation paper and foils of various types. The powerful brushless servo motor, equipped with a four-ratio gearbox, allows the operator to select an appropriate maximum winding speed and torque for each individual task. The all-new machine operating software has an intuitive graphical interface and a 10-inch (254mm) full colour touch screen - with on-screen help and user’s choice of language - which allows windings for even the most complex coils to be programmed in short periods of time. Program storage is on a standard SD memory card for fast and simple backup of winding programs, with the option of Windows ™ software, "WIN bobbin" for full PC connectivity.